Children love sharing their discoveries from visiting the ocean with their families. One day, the children began talking about the jellyfish they had seen. This sparked an interest with many of the children, so we began asking them what they knew and wanted to learn about these creatures. We started our learning by observing photographs and diagrams. 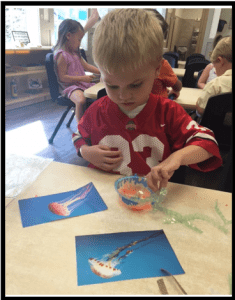 We began to study the different parts of the jellyfish with a particular interest in their stinging tentacles. To create their individual jellyfish, the children collected natural materials such as clear plastic tops, twine and bubble wrap. They incorporated the bell, mouth, oral arms and tentacles. One of the students remarked, "I want a neon jellyfish!" So, he chose to paint his bell with fluorescent paint to ensure his jellyfish could be seen in the deep, dark ocean. 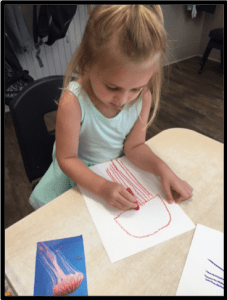 The children utilized their fine motor skills and vocabulary as they drew jellyfish using oil pastels. Another student observed that "the jellyfish needs water to live." 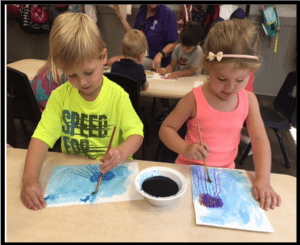 So, the children painted over their drawing with liquid watercolors to create a drifting or wandering jellyfish in the ocean. 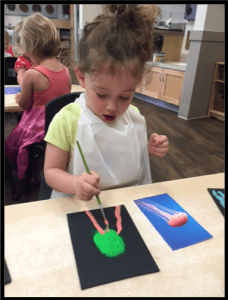 The children were fascinated with the jellyfish and their many colors. They are so proud of their miraculous masterpieces!